The secret sauce that makes the texture of this piece so interesting is both encaustic (pairing with wax) and epoxy resin. I found an old schematic and copied it with laser ink, reversed it in Photoshop and transferred its ink to the wax surface. I put a few more layers of clear wax over it, cut out troughs for the four boxes, in which I had placed vintage electronic parts and secured with a poured pool of epoxy resin, and fixed the boxes in place with more encaustic, the coppery colored goop. 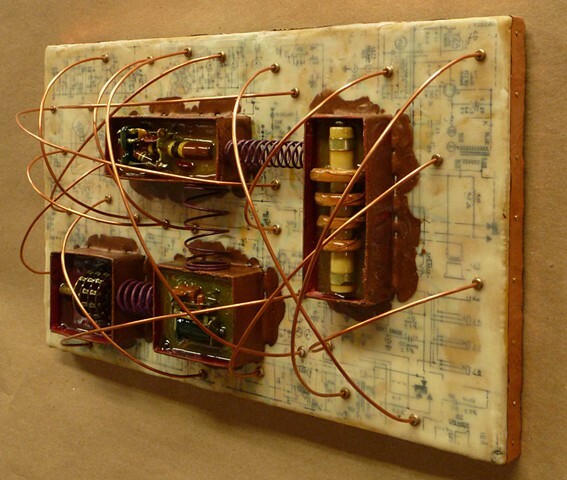 The wires and springs (from my old friend, Don Hamilton) seemed like just the idea to make the relatively flat piece come alive.